Description: The stages of construction of structural model are expounded for the estimation of degree of informing of images. An informative model is based on presentation of arrays of co-ordinates of apertures on the scale of colored as two measuring position numbers with unequal nearby elements. The presence of surplus is proved in the arrays of co-ordinates of apertures, conditioned prohibition of possible combinations of the as two measuring matrices made from elements. Structuring-combinatory nature of surplus is grounded in the arrays of co-ordinates of apertures, caused imposition of limits on a dynamic range and on the alphabet of taken on values by the elements of arrays of co-ordinates of apertures. Stasev, Iu.V. and Krivenko, S.I. 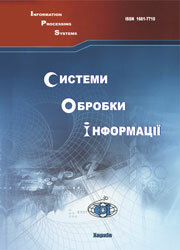 (2008), “Strukturnaia model massivov koordinat apertur na shkale tsvetnosti izobrazhenii”, Information Processing Systems, Vol. 3(70), pp. 133-135.